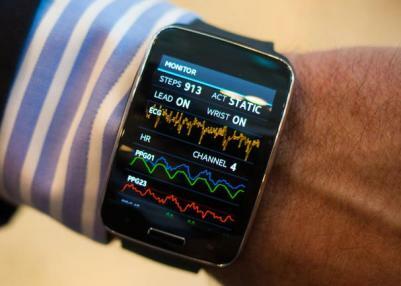 Samsung unveiled a new wearable fitness tracker reference platform called SIMBAND. The SIMBAND is aimed towards device makers that can customize and change its design to create their own wearable trackers. The SIMBAND looks very similar to the Gear S, and it too uses a 2" curved flexible AMOLED. The SIMBAND also uses several sensors (optical, electrical and physical) that enables it to track the heart rate, blood flow and pressure, skin temperature, CO2 and oxygen levels and EKG. It uses an ARM-based CPU and has a hot-swappable battery. Samsung's Gear S flexible-AMOLED wearable coming to the US "this fall"